It’s an issue that’s been discussed around campsites for years now: what’s the best way to power your RV? While most campsites do have electrical hookups available, what about those times when you’re camping away from one or you’re in a campsite where all the hookups are taken? There are two main power options you’ll come across: generator power and solar power. A generator provides a large amount of power in bursts when it’s turned on while solar power provides slow, steady power over a long time. One thing to note up front is that the solar vs. generator debate really isn’t an either/or situation. There are some high-powered appliances like an air conditioner or microwave that a solar setup just can’t handle, so you’re not going to be able to ditch the generator entirely. A good bit of the time though, that generator is producing far more power than you need. 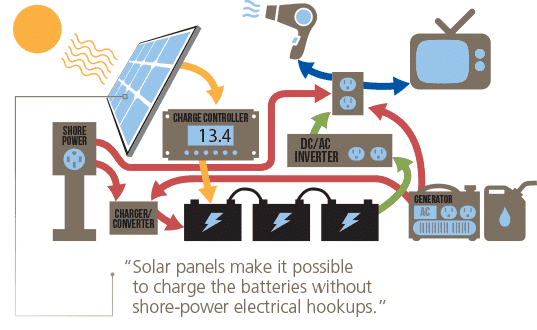 It’s also important to remember that solar panels on their own don’t directly provide power. They charge batteries that provide power. Those batteries though, are enough to handle any 12-volt device and plenty of low wattage devices like laptops and televisions through an inverter. 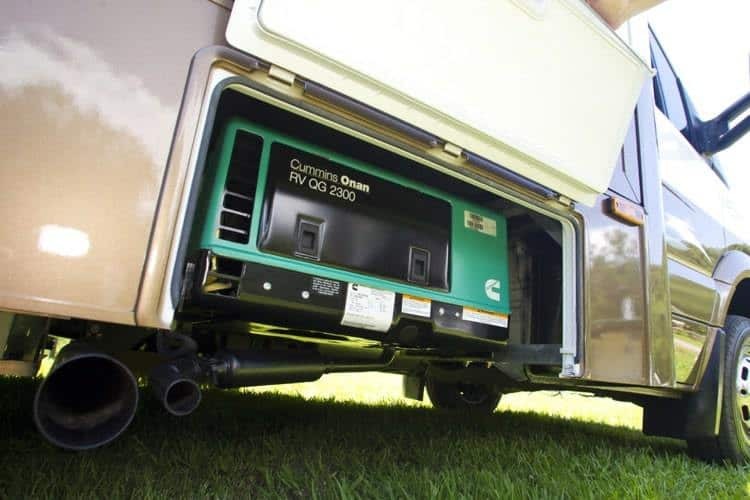 The majority of RVs actually have inverters on board so you can plug into an outlet just like you always do. You’ll see the most benefits with solar power if you’re boondocking – camping in the “boondocks” without any electricity around. But there are benefits to be had even if you always stay on the beaten path. Now that you know the basics if you’re considering using solar power for your RV, here are the biggest benefits you’ll take away. Perhaps the biggest appeal of camping is getting in touch with nature and getting away from the noise, and the growl of a generator can be pretty jarring. And with a setup that’s totally generator based, you’ll be firing it up any time you want to watch TV, cook, clean, turn on the lights, or really use your RV at all. If you’re camping around other people, a noisy generator is a quick way to make a bad impression on your neighbors. There are generator models made specifically for RVs that are a little quieter than home models, but they still produce noise. If you bring a construction model or a home model though, it’ll be much noisier (and maybe even forbidden). Since solar panels are totally silent, this is an area where they clearly come out on top. Most people who camp are at least a little environmentally minded, and using solar power is certainly better on the environment than a generator. Generators do have emissions guidelines mandated by the government, so they’re not brutally bad on the earth, but any change you can make is a good one. Generators also bring the potentially deadly issue of carbon monoxide poisoning. It’s not widespread, but poisoning from a generator exhaust happens. These devices have carbon monoxide detectors, but they can – and do – malfunction. In terms of cost, solar power wins over a generator hands down. After all, there’s nothing more low-cost than the sun. Like a traditional gas-powered generator, there is some cost initially, but once you pay to install your solar system, you’re not paying for maintenance and you’re not paying for fuel again and again. There are no moving parts, which means there’s nothing to break. A solar power system can easily last for 10 years or more. Budgeting is a sticking point for most people, but don’t let solar scare you. As technology has improved, the price of solar has dropped dramatically. Depending on your needs, you can actually get a small solar system installed that’s quite affordable. There are even portable solar panels these days that don’t have to be permanently installed on your vehicle. As a general rule, generator use is okay in U.S. National Parks provided it falls below a certain decibel level and is only run during certain hours. But they can actually be banned in some locations depending on the time of year. If there’s a local fire ban or if there are protected birds roosting nearby, you may find yourself without power if you’re relying solely on a generator. If you’re using solar as your primary power source, you’ll never run afoul of local laws. Rules do vary from park to park, so it’s wise to check with your park before you go. Maybe the single biggest benefit of solar power is that it gives you the freedom to travel anywhere you want. You might have to live without your air conditioner, but as long as you can do that, you’re not limited to going where you have a hookup. For a lot of campers, you’re not really getting away until you’re boondocking. And that’s no trouble when you’re using solar power. The ability to have power no matter where you are means you can get away from the popular campsite and find secluded spots to really get in touch with nature. Solar power also means you don’t have to plan your length of stay around the amount of fuel you have. You can stay off the grid as long as you like. 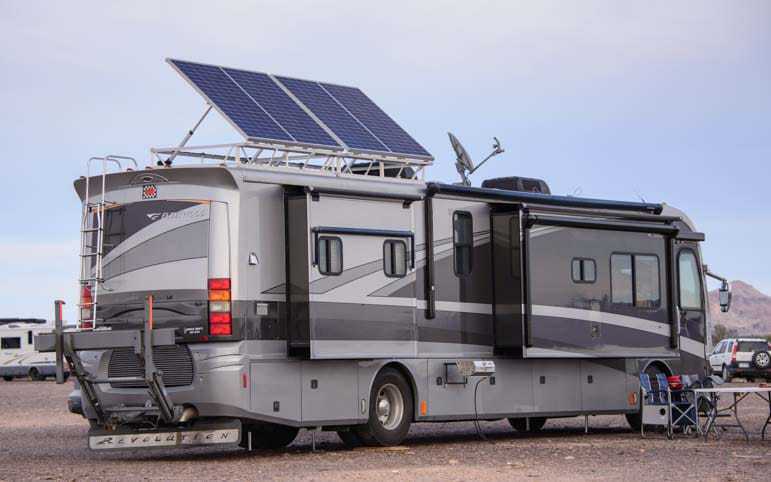 Solar power for an RV is clean, quiet, waste-free, maintenance free, and free to operate. And you’ve got a virtually unlimited supply even on cloudy days. Making the leap to solar power can be overwhelming and confusing, but once you make the move, you’ll be glad you did. 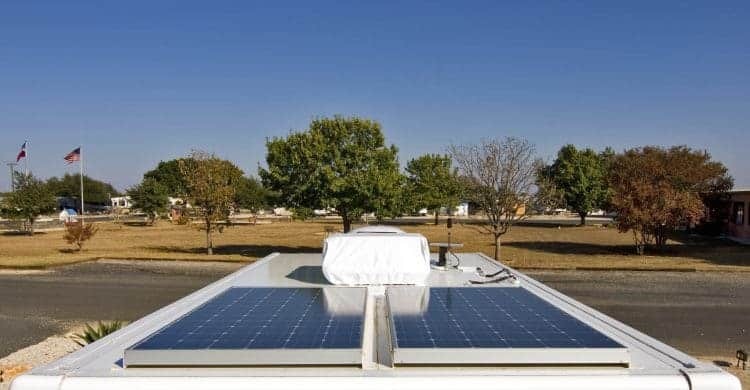 Especially if your RV travels are going to take you to parts unknown into areas where there’s no electricity, solar is an option you’ll definitely want to consider because it comes with nothing but benefits. Have you made the leap to solar power and it changed the way you travel? Are you dedicated to your trusty generator and wouldn’t consider relying on the sun? Let us know your experience.